Unhappy with oil-linked prices, energy-hungry Asian giants are looking to new gas suppliers. By 2017, a minimum of 10 percent of projected Indian liquefied natural gas (LNG) re-gasification (import) capacity is set to be serviced by the United States. With gas pipeline projects to India’s west unlikely to take off soon, Indian gas importers are on the lookout for further North American LNG supplies, which later in this decade are expected to be cheaper than oil–linked cargo originating from Qatar. Along with Japan, India is also leading an Asian buyers’ consortium to break oil-indexation in the Asian LNG space, which buyers consider a prime factor in making it the world’s most expensive regional gas market. The success of this initiative hinges on the willingness of the U.S. political economy to move more quickly in making greater supplies available to non-free trade agreement (FTA) countries such as India and Japan. The U.S. thereby has to make a strategic call to align with a buyer’s group to allow its LNG exporters to capture market share in the medium term. However, the extent to which Indian gas importers will serve as “anchor buyers” for U.S. LNG will also depend on the growth of a similar relationship with Canada. Indian domestic gas production has actually been declining in recent years, with the demand-supply gap expected to continue to widen until at least 2020. With both the IPI and TAPI projects still subject to geopolitical headwinds, a major increase in LNG import capacity is underway. Yet Asian LNG spot prices have been hovering around the $18 per million metric British thermal units (mmbtu) mark, and at these prices there are few takers for imported gas, as Indian major GAIL is discovering with its regasification plant in Dabhol operating at only a fraction of designed capacity. These high prices stem from their traditionally close links to Japanese Crude Cocktail (JCC) prices (consistently over $100 per mmbtu for a while now) from sources such as Qatar, which insist on it. As India’s Minister of Petroleum and Natural Gas Veerappa Moily put it recently “The practice of oil-linking has no relevance … and is largely responsible for such abnormally high prices.” This sentiment is of course shared by the Japanese, who post-Fukushima have become the world’s largest LNG importers and who have been talks with India to coordinate LNG purchases globally. 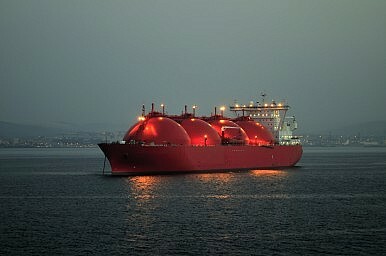 A result of those talks has been an agreement between Japan’s Chubu Electric Power Co and GAIL to buy LNG jointly. This agreement comes at a time when both Indian and Japanese majors have firmed up long-term supply contracts with U.S. LNG operators who have secured complete approvals for non-FTA export at Henry Hub prices. India’s GAIL, for instance, is already contracted to receive 3.5 million tonnes per annum (mtpa) of LNG starting 2017 from Cheniere’s Sabine Pass terminal in Louisiana at a 115 percent markup over Henry Hub plus a $3 per mmbtu capacity charge. Even at a Henry Hub price of $6 per mmbtu (which is unlikely once winter is over), this would still be cheaper than the price Asian buyers are paying currently and expect to pay if oil-indexation is maintained at current levels. Indeed apart from sourcing potentially cheaper gas, the move to secure Henry Hub prices is an attempt by Asian buyers to put pressure on their existing suppliers to move away from oil-indexed contracts. GAIL incidentally has also contracted to export another 2.3 mtpa from Dominion Energy’s Cove Point plant from 2017, taking its total for U.S. supplies to 6 mtpa. All of it is destined to be sold in India, which will have 48 mtpa of LNG import capacity in place by then. Meanwhile, the commitment by Asian buyers to such large “anchor” contracts has helped remove some of the initial doubts expressed by U.S. analysts about the viability of U.S. export terminal projects (complete approvals for non-FTA exports have been granted for four projects, with 23 more awaiting review). Most of these U.S. LNG export projects are actually existing LNG import terminals on the U.S. Eastern Seaboard that are now adding liquefaction facilities and boast a significant “brownfield” cost advantage over greenfield facilities in Australia and East Africa that also target the Asian market. Moreover with the prospect of a widened Panama Canal re-opening sometime this decade, Gulf coast LNG terminals will see their distance disadvantage to growing Asian LNG markets reduced considerably. But domestic opposition to U.S. LNG exports remains, with the petrochemicals industry in particular hoping to become a major beneficiary of lower gas prices, reflected in recent statements by Dow Chemical. It is also true that Henry Hub prices this February reached five year highs, reflecting an unusually cold winter. Regardless of this current spike, though, Henry Hub prices in the last two years of mostly below $4 per mmbtu have contributed to a 72 percent fall in drilling rig numbers since 2009. While natural gas production continues to rise in the U.S. on sustained recoveries from existing finds, most new investment is directed towards so-called wet plays that possess a mix of liquid hydrocarbons along with natural gas, rather than dry ones containing gas only. Investment by Asian majors in upstream shale finds is ultimately contingent on their ability to export the gas back home. GAIL’s Sabine Pass commitment, for instance, is linked with its investment in the nearby Eagle Ford Shale serving as a gas linkage. Indeed, balanced against the clamor for lower prices domestically is the need to export U.S. gas to sustain the boom without instability while a window of opportunity exists in the Asian LNG market. Citigroup believes that exports will help support Henry Hub prices of $5.5 per mmbtu over the long run – a goldilocks level that encourages new investment while keeping exports competitive. Moreover, LNG export terminal activity is already stimulating the job market in states such as Texas and Louisiana. This mix of concern and opportunity is reflected in the current multi-stage process for approval of LNG exports to non-FTA countries, as contained in Section 3 of the U.S. Gas Act. Although this process is leading to the green-lighting of some projects, it is taking a minimum of at least 36 months. Even as U.S. politics plays itself out, Canada – long seen as a laggard in the LNG game – has been overtly expressing its enthusiasm as meeting Asian gas requirements. Canada’s own domestic gas prices of $2-$3 per mmbtu, attributable to the shale boom, has already attracted considerable investment from Indian fertilizer companies. However, the high costs of greenfield LNG export projects on Canada’s Pacific coast were causing Indian firms to adopt a wait and watch approach – until now. Last week it was disclosed that an Indian consortium had bought a 25 percent stake in the Petronas led Pacific North West LNG project. It is important to note that Canada’s National Energy Board grants LNG export approvals in around 10-11 months and Indian majors are eyeing Canada’s only existing LNG import terminal in Saint John, New Brunswick, hoping to secure a brownfield advantage. With Canada in the picture, in addition to new projects across the world, Asian buyers in Japan and Taiwan have already begun to secure non oil-indexed contracts. For its part, the U.S. wants Asian buyers to commit to large volumes so that being used as a negotiating tool with Russia and Qatar. However, Asia buyers know that prior to the shale boom, current Henry Hub-linked formulas would have made U.S. exports quite uncompetitive. And so the India-U.S. energy dialogue continues. A Fillip for the TAPI PipelineCan the US Solve Japan’s Energy Crisis?India’s Shale Gas Boom: Dream or Reality?The "Fracking" Revolution Comes to ChinaAmerica: The Next Energy Superpower?